Today is my day in the Dog Gone Cute Blog Hop. I am a bit late getting my post up because I was thinking tomorrow was my day. Today is certainly better than waiting until tomorrow though because I am so excited to tell you about Lorna from Sew Fresh Quilts! Since it's high time I put the spotlight on another Canadian Pattern Designer for my "Spotlight on Canadian Pattern Designers" blog series the timing is perfect. Lorna is a fantastic Canadian Quilt Pattern designer. I mean really, really good. She is one of my all time favourite pattern designers. Her "Dog Gone Cute" pattern is my most favourite pattern so far. I am a major dog lover and this is just adorable. The pattern comes with eight dogs in two sizes (small and large) but the possibilities for different dogs are endless. You can sew them with ears up or ears down. Change up your colors. Use solids or prints. It's so much fun! Each dog has very clear diagrams and instructions every step of the way. They are actually quite easy to put together and I haven't had to unpick a single seam. All the pieces are named with a letter so I use "Alpha bitties" from The Fat Quarter Shop to keep everything straight and that really speeds up the process for me. Dog Gone Cute dogs 1, 2 and 4. My sewing time has been quite hectic and stressful lately. Not relaxing as it should be. I am disappointed that I only have three dogs sewn up to show you but I am very pleased with these three. My plan is to make a baby quilt for my dog loving baby girl and hopefully a large quilt for my sister too. The first dog I sewed was dog 4 because he looks like my old Jack Russell Terrier that we had to put down last June. Morey, the crazy Jack Russell Terrier, panting after chasing his ball. How you use your fabric can make the dogs look like different breeds as well. There were a few comments on my Instagram feed about what dogs people thought these were. Dog Gone Cute dog 2. So far all my fabrics are Kona Cottons but I think I will change it up and add in prints for some of the other dogs. 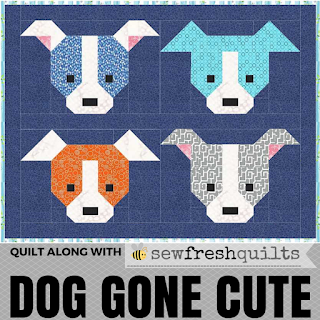 Some of the dogs I've seen made with prints in the hashtag on Instagram - #DogGoneCuteQAL - have been so cute! Dog Gone Cute dog 1. Make sure you click over to Lorna's blog Sew Fresh Quilts to see what the other bloggers on the hop are up to and visit her online shops to get your copy of the pattern. And speaking of Lorna's shops. Oh my goodness! I cannot rave enough... you've got to check out her other patterns. I've bought four of them so far I think but I want them all! The Elephant Parade pattern is really popular and that is another one I plan to sew for my baby. You can grab this cute Quilt Along button on her blog and put it up on yours to let everyone know you're part of the quilt along. There's still lots of time to join in as this is only day 4 on the blog hop.